You’ve probably heard of the Higgs boson. This elusive particle was predicted to exist long ago and helped explain why the Universe works the way it does, but it took decades for us to detect. Well, there’s another elusive particle that has also been predicted by quantum physics, and it’s been missing for an even longer time. In fact, we still haven’t spotted one, and not through lack of trying. It’s called the magnetic monopole, and it has a few unique properties that make it rather special. Those with an interest in physics are probably already familiar with an electric monopole, although you may know it by its more common name: electric charge. Opposite electric charges attract and like charges repel through the interaction of electric fields, which are defined as running from positive to negative. These are the somewhat arbitrary labels for the two opposing electric charges. Electric monopoles exist in the form of particles that have a positive or negative electric charge, such as protons or electrons. At first glance, magnetism seems somewhat analogous to electricity, as there exists a magnetic field with a direction defined as running from north to south. However, the analogy breaks down when we try to find the magnetic counterpart for the electric charge. While we can find electric monopoles in the form of charged particles, we have never observed magnetic monopoles. Instead, magnets exist only in the form of dipoles with a north and a south end. When a bar magnet is split into two pieces, you don’t get a separate north part and a south part. Rather you get two new, smaller magnets, each with a north and south end. Even if you split that magnet down into individual particles, you still get a magnetic dipole. When we look at magnetism in the world, what we see is entirely consistent with Maxwell’s equations, which describe the unification of electric and magnetic field theory into classical electromagnetism. They were first published by James Maxwell during 1861 and 1862 and are still used daily on a practical level in engineering, telecommunications and medical applications, to name just a few. But one of these equations – Gauss’s law for magnetism – states that there are no magnetic monopoles. The magnetism we observe on a day-to-day basis can all be attributed to the movement of electric charges. When an electrically charged particle moves along a path, such as an electron moving down a wire, this is an electrical current. This induces a magnetic field that wraps around the direction of the current. The second cause of magnetism involves a property from quantum mechanics called 'spin'. This can be thought of in terms of an electrically charged particle rotating on an axis rather than moving in a particular direction. This generates an angular momentum in the particle, causing the electron to act as a magnetic dipole (i.e. a tiny bar magnet). 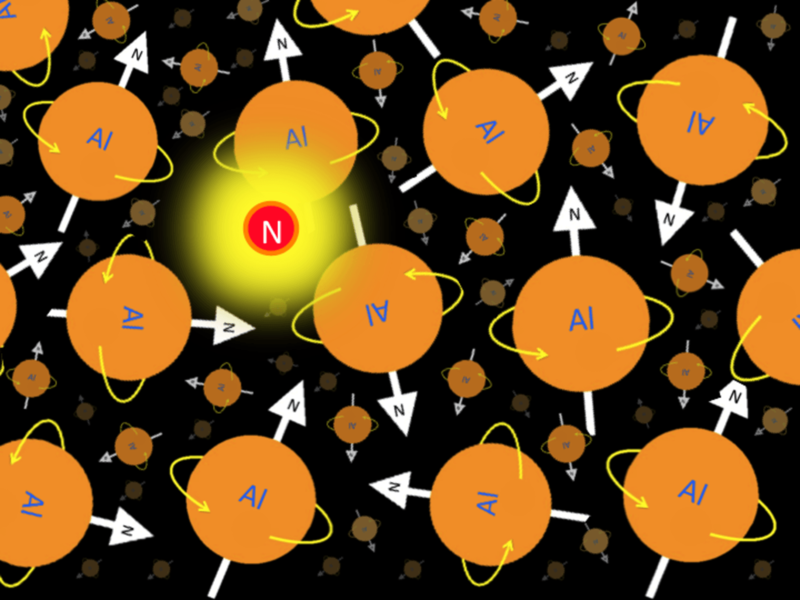 This means we can describe magnetic phenomena without the need for magnetic monopoles. But just because our classical electromagnetic theories are consistent with our observations, that does not imply that there are no magnetic monopoles. Rather, this just means that there are no magnetic monopoles anywhere that we have observed. Once we start to delve into the murky depths of theory, we begin to find some tempting arguments for their presence in the Universe. In 1894, Nobel Laureate Pierre Curie discussed the possibility of such an undiscovered particle and could find no reason to discount its existence. Later, in 1931, Nobel Laureate Paul Dirac showed that when Maxwell’s equations are extended to include a magnetic monopole, electric charge can exist only in discrete values. This 'quantisation' of electric charge is one of the requirements of quantum mechanics. So Dirac’s work went towards showing that classical electromagnetism and quantum electrodynamics were compatible theories in this sense. Finally, there are few physicists who can resist the beauty of symmetry in nature. And because the existence of a magnetic monopole would imply a duality between electricity and magnetism, the theory suggesting magnetic monopoles becomes almost intoxicating. Duality, in the physical sense, is when two different theories can be related in such a way that one system is analogous to the other. If it were the case that the electric force was completely analogous to the magnetic force, then perhaps other forces would also be analogous to one another. Perhaps then there would be some way to relate the strong nuclear force to the weak nuclear force, paving the way to a grand unification of all physical forces. Of course, just because an hypothesis has an appealing symmetry doesn’t make it correct. Scientists have come close to seeing magnetic monopoles by producing monopole-like structures in the lab using complex arrangements of magnetic fields in Bose-Einstein condensates and superfluids. But, while these show that a magnetic monopole is not a physical impossibility, they are not the same as discovering one in nature. Particle physics experiments have, on occasion, announced possible monopole candidates, but so far none of these discoveries have been shown to be irrefutable or reproducible. The Monopole and Exotics Detector at the Large Hadron Collider (MoEDAL) has taken up the search, but has found no monopoles to date. As a result, magnetic monopole enthusiasts have turned their sights to explaining why we haven’t seen any monopoles. If the current generation of particle accelerators have failed to detect a magnetic monopole, perhaps the mass of a monopole is simply greater than we are able to create at present. Using theory, we can estimate the maximum possible mass for the magnetic monopole. Given what we already know about the structure of the Universe, we can estimate that the monopole mass could be up to an enormous 1014 TeV. An object this massive may have been produced only in the very early stages of the Universe after the Big Bang, before cosmic inflation began. If the Universe cooled to a point that monopole creation was no longer energetically possible before expanding, perhaps the monopoles are out there. Just few and far between. The trick is to find one. T'Mir Danger Julius, Data Scientist, Swinburne University of Technology.